The Birmingham Assay Office has announced a series of new Touch Acid testing training courses for 2013. An Introduction to Touch Acid Testing is a half-day, practical course designed to provide delegates with the basic knowledge needed to test and identify precious metals including gold, silver, platinum and palladium. The course is aimed at those with little or no experience of touch acid testing. Delegates also learn about the chemistry behind the reactions in order to interpret the results accurately. The Course will consist of: Touch Acid Testing Theory session: the determination of different carats of gold and silver utilising different acid solutions. Delegates will learn about the chemistry behind the reactions in order to interpret the results accurately. A ‘Hands-on’ practical session with experts in our Laboratory. The practical session will take place in The Birmingham Assay Office’s Laboratory. It is led by Ian Bayley B.Sc, C.Chem, MRSC. Ian is the Assay Office’s Senior Analyst and Quality Assurance Manager. 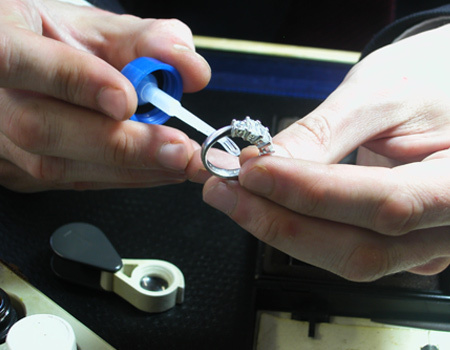 He has over 25 years experience in assaying and quality control of precious metals.